ENROLL NOW FOR FALL SEMESTER! Scientific studies are proving what Miss Barbara's Child Development Center has known for the last 43 years: Children who attend pre-school are happier and more successful in all areas of their life than children who do not attend pre-school. Preschool students are more likely to go on and receive positive accolades in school, have a network of friends, and attend college, among many other positive benefits. Miss Barbara's creates a lovingly warm and educational environment to foster your child's future success. 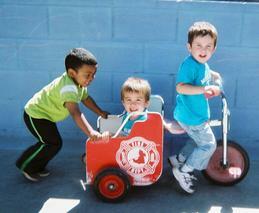 Miss Barbara's Child Development Center believes that each child should be treated and respected as in indivifual. We strive to create a better world for your child by providing security, warmth and nurturing while reflecting the values of your family in a positive way. We make your chlild's world a place of creative experiences, educational endeavors and social responsibility. We know that the selection of pre-school is one of the most important decisions you can make for the development of your child. Let us help you with your decision. Each staff member completes a thorough application, screening and training process. They must complete a minimum of 12 units in early childhood education to be considered a teacher in the classroom. This includes backgropund record check, finger printing, employment reference check and a physical examination. All staff are CPR and first -aid certified. Through the 43 years here at Miss Barbara's Child Development Center we have developed our own curriculum proven to develop a strong academic foundation for your child to develop a liking for learning. We believe in making learning child's play. There is emotional, social, physical and intellectual growth going on at all times in our program. In our use of monthly themes, weekly topics and our planned daily activities, we keep our curriculum focused and fun. Use of letters and numbers of the week, songs, rhymes and stories keep a strong litericy-based approach to reading readiness. 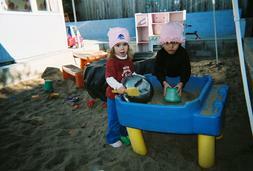 Social interaction, dramatic play, art and music help to build self-esteem and explore creativity. We strive to take the whole child's development into consideration when planning our day. There are parent conferences twice a year and sooner if either the teacher or parent request one. We will treat each child as an individual and meet his/her needs as much as possible. 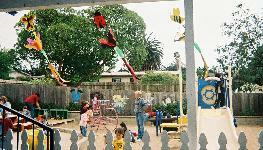 Miss Barbara's Child Development Center is an equal opportunity service. Children and families will not be discriminated against on the basis of race, religion, lifestyle, national origin, gender, need for special care or marital status of parents. Come on in to our playground! We really like it here at Miss Barbara's! Enroll now for Fall Semester!! We invite you to come in and experience the fun we have at school!